Some suggestions on how to buy night vision devices. It is common, that to make a right choice is generally not an easy task. Currently there are hundreds of different types of models of night vision devices from different manufacturers on the market. The reading of abstruse instructions with manifold technical information brings no new insights for the inexperienced buyer. From time to time the uninformed purchaser may be misled by excessive and unrealistic (not uncommonly 5 – 100 times higher) product performance figures, which are for bait advertising only. The following information includes basic knowledge about night vision. The intention is to support the night vision interested purchaser and offer him a better knowledge in this specialty area – to make a right choice. We are also always grateful to help you with any technical questions or practical operating issues, personally. All night vision devices (residual light intensifier) operate on a basis of multiple amplifying of available light sources at a visible and near-infrared wave range. The night vision device consists of a lens, an image intensifier tube (tube), a power source and an ocular. 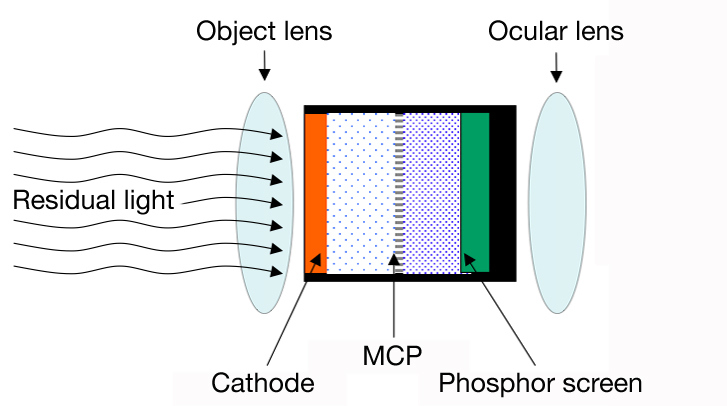 The available ambient light (residual light) which is emitted by the observed objects gets through the optical- lens, further through the entrance of the tube on a plate with a photosensitive layer (cathode) by what the image of the observed object is formed. This image is electrically amplified and projected in the vacuum chamber on the output side of the tubes phosphor layer (screen). The result is a greenish-yellow optical picture, which gets through the lens to the eye of the observer. Only a few high-tech tubes (ONYX™ – Technology) operate in a natural black/white modus. BLACK/WHITE (ONYX™) is the alternative black/white night vision technology. Several studies have shown that observed happenings at night are looking more natural by using the black/white technology, instead the usual green one. The black/white technology is invented for those, who value a less eye stressing night observation. This black/white technology is more precise and clearer by transmitting information such as contrast, shapes and shadows. Basically: the qualities of a night-vision device are determined by the tube and the optical system. Compatible with the introduced terms there are differences among the types of tubes of Generation I, Gen. II and Gen. III (with subdivisions Gen. I+ and Gen. II+). Whereby the tubes of the European production (PHOTONIS) are not entirely matching the classifications (Gen. I, I+, II, II+, III), which were introduced by the USA (ITT). Therefore this (European) production has to be considered separately, because the European developers stroke another way and developed their own advanced technologies (CommGrade 1441/1451, CommGrade ECHO, SuperGen®, XD-4™, XR5™). The figure of merit (FOM) is used to determine the performance of a tube. This value is easily calculated for all types of tubes from known measured values. It provides a very distinctive insight in the performance and quality of all modern types of tubes. This parameter is used by the US authorities for determining the exportability of a tube. It means that the US export of tubes with a high FOM value is regimented and limited, since this value precisely defines the military advances and the performance of the tube. The FOM value is calculated in the following manner: S/N x lp/mm (S/N = signal to noise ratio). The FOM value is able to reach currently* a rate of 2000, by Gen. II, Gen. II+, ECHO, SuperGen®, Gen. III, XD-4™ and XR5™. It is an extreme high value, but not the maximum (PHOTONIS is able to reach a value of 2340 with XR5™ tubes – this value is a peak currently* around all types of tubes. The purchase of this technology is only possible for a few state security institutions, which have no restrictions and posses an unlimited budget). The FOM value varies from one tube to another. Many good tubes have currently* a FOM value of app. 1600. But also tubes with a considerable lower FOM value can be of excellent quality. Thus, the FOM is only one of many other parameters. Therefore it is very important whether the tube is individually meeting the requirements and if the advisory service for the customer is designed in a fair way. Thus, tubes with a very high S/N value and a very high resolution (lp/mm) have the highest FOM value. The Generation I tubes posses a glass-vacuum chamber with a cathode photosensitivity of 120 – 250 µA/Lm, at 2850K. The light amplification of such type of tubes is between 120 – 900 times, the resolutions of pairs between 25 – 35 lp/mm (Development from the middle of the 1950s). This type of devices that are equipped with Gen. I, you may find on the market for app. 300 EUR. A specific characteristic of the Gen. I devices is, that the reproduced image is only sharp in the middle and distorted at the borders of the observation image. Especially if diverse light sources like flashlights or illuminated windows emerge in the field of view – the whole observation image is overexposed and the observation is utterly impossible. After their manufacturing, the tubes are classified within their Generation-categories in quality grades (A, B, C and not successful manufactured tubes with grade D). This division is reflected in the prices of the tubes. This explains why, similar devices of the same generation category of various manufacturers are offered at different prices. The division in diverse quality grades is based on photosensitivity of the cathode, resolution and clarity of the image. The little black dots should not be disturbing for the observer in the darkness, wherefore the purchaser should not criticize this characteristic. In contrast, devices with bright and permanent shining points or with a bright spot in the middle of the image are unsuitable for a good observation – please do not buy these products. Also is not recommended to purchase low-contrast tubes with a dull and blurred image. The purchaser may understand and recognize whether the image is clear or spots loaded, but only a trained eye is able to ascertain the photosensitivity of a device – which in fact is the major criteria. The photosensitivity is tested under realistic nighttime conditions, by comparison of various devices. Due to the low amplification, the single-stage (single-stage = 1 tube, multistage = 1, 2, 3 tubes built in a row) Gen. I devices are depending on the light intensity of the optics and on the performance of the tube. Only devices with high-quality tubes in connection with especially light sensitive optics (relative aperture not higher than F1.5) are able to ensure an optimal observation during twilight and total darkness with ¼ moonlight. At lower surrounding illumination the night vision device (image intensifier) requires an additional light source, an IR-illuminator. Very good Gen. I devices have an automatic protective function against high increase of the overall lighting level, thus this function counteracts the wearing of the tube when suddenly intense light sources appears or the device is unintentionally switched on at daylight time. To increase the performance a number of tubes are placed in one case (multistage devices). The light amplification of a three-stage-device can be app. 20000 up to 50000 times higher. However, through this procedure strong distortions occur and the resolution on the edges of the image decreases intensely. Multistage devices are unhandy and heavy, that’s why they have been almost forced out of the market by devices of the Gen. I+ and Gen. II. Devices of the Gen. I+ and Gen. II have an obviously better performance and are only a bit more expensive then the multistage devices of the Gen. I.
Gen. I+ tubes a further development of the 1st generation (development from the end of the 60s). In the construction of Gen. I+ tubes a fiber optics slice is placed at the input (sometimes also at the output) instead of a flat glass – thereby the resolution of the tube is increasing substantially, the shape-distortion is being reduced and the anti-dazzle function from lateral dazzling effects increased. Such types of tubes are characterized by a light amplification of app. 1000 times, the photosensitivity of the cathode is at least 280 µA/Lm at 2850K and the resolution of the line pairs in the centre of the image is between 45 – 50 lp/mm. The difference between devices with Gen. I+ tubes and their previous model with Gen. I tubes, is a clear and pleasant picture, low self-noise and a greater observation distance – in the passive and active state (using the IR-illuminator). These Gen. I+ devices are preeminent applicable in urban areas. Additionally, by natural light (residual light) are such devices applicable up to a limit value of ¼, of the natural moonlight. The price of a Gen. I+ tube is only app. 4 up to 9 times higher than the price of a Gen. I tube. The Gen. II tube differs constructional from the Gen. I+ tube due to the presence of a special electron-amplifier – microchannel plate (MCP), which is placed between the cathode and the phosphor layer (screen) (Development of the end of the 60s). In such a tube, the electrons are multiplied by a very high quality, high-class micromechanics (with 8 – 12 millions channels of only 18mm diameter effectiv area). The effort necessary to produce such a high-class tube is reflected in the price of it. By manufacturing a Gen. II, II+ tubes a Multi-Alkali cathode is exclusively used. This image demonstrates a magniffied 25mm MCP (diameter of the effective area is approx. 18mm). Such types of tubes are characterized by a light amplification of app. 25000 up to 50000 times, the photosensitivity of the cathode is at least 240 µA/Lm at 2850K and the resolution of the line pairs in the centre of the image is between 32 – 38 lp/mm. Life expectancy of Gen. II tubes is around app. 1000 up to 3000 hours. Gen. II tubes also differ in two types of microchannel plates (MCP): 25mm and 18mm. From the view of the observer a plate with a larger diameter ensures a comfortable observation (comparable with a TV), but logically increases the size of the device. The Gen. II+ devices have no acceleration chamber. The tubes are characterized by a light amplification of app. 25000 up to 35000 times, the photosensitivity of the cathode is at least 500 µA/Lm at 2850K and the resolution of the line pairs in the centre of the image is between 39 – 45 lp/mm (Development of the end of the 80s). Life expectancy of Gen. II+ tubes is around app. 1000 up to 3000 hours. Due to the absence of acceleration chamber is the light amplification by Gen. II+ tubes lower then by tubes of the Gen. II. By the difference in the photosensitivity of the cathode and particularly higher sensitivity for infrared light, the Gen. II+ devices are prove to be better than the Gen. II devices by natural light (residual light). If the main task of the night-vision device is to shot photos or/and videos, it is advisable to choose a Gen. II device with a higher light amplification. All devices of the Gen. II and Gen. II+ have an automatic brightness control (ABC) for retaining the equal brightness by changing of the ambient light (residual light), as a automatic protective function by intense increase of the overall level of illumination, bright source protection (BSP) for blooming-protection of strong punctual light, as well as high image quality without distortions over the entire screen area. Gen. II and Gen. II+ devices belong to professional night vision and are currently in the military use, because these devices are able to operate during very low ambient light (residual light) – which can be compared with a starry sky or even partly clouded starry sky. Gen. III tubes differ from the Gen. II+ tubes by their construction of the cathode. Gen. III tubes have a Gallium-Arsenide cathode (GaAs) with more sensitivity for IR-light. The light amplification is around app. 30000 up to 55000 times, the photosensitivity of the cathode is around 900 – 1600 µA/Lm at 2850K and the resolution of the line pairs is 32 – 64 lp/mm (omnibus 1 and omnibus 2 where developed end of the 70s, omnibus 3 and omnibus 4 is a further development of the late 80s. Omnibus 7 is currently* the most powerful Gen. III tube with a FOM value of app. 2300). The performance of Gen. III tubes may vary, depending on type and specifications (omnibus 1 up to currently* 7 Pinnacle), by circa 300%. The life expectancy is around 10000 up to 15000 hours, which is 3 – 4 times longer than the Gen. II tubes. Devices with Gen. III tubes are operating excellent in extremely low ambient light (residual light). The observation image is saturated, sharp, with excellent contrast and recognition of also smallest details. ECHO, XD-4™ and XR5™ tubes with an AUTO-GATING function are excellent suitable for operations in urban area. AUTO-GATING is a special control electronics solution that is able to switch the tube on and off with a very high frequency, which is imperceptible by the eye. This innovative function allows the observer to operate in bright ambient light, or even in daylight operations. By keeping the full capability and performance, this function provides an efficient wear- protection of the device. Furthermore this electronic solution eliminates the glare of the light source by maintaining the performance. Moreover, this function meets the high tactical requirements – for instance by operating under bright lighting conditions such as military operations in urban terrains which define many of today’s missions. This special control electronic solution prevents blending and shadowing by variant types of light sources or fire and helps to minimize the abrasion of the tube. Night vision devices optics consists of a lens and an ocular. The major requirement on a lens is a high light-transmitting function of the visible and invisible range of the IR-light. This light-transmitting function is expressed with the figures of the F-numbers (relative aperture), for instance F1.0, F1.4, F2.0, F2.8, F4.0, etc. On increasing of the figure by one the lens is transmitting 2 times less light. A high relative aperture (lower figure of the F-number) is a very important factor for a night vision device, especially for night vision devices of the Gen. I and Gen. I+. The consequence of a lowering of the relative aperture until a value of F2.4 – F2.8 is that the naked eye perceives more than a night vision device of the Gen. I with a switched-on IR-illuminator. The development and the subsequent production of optics with a low F-number F1.5 (high relative aperture) is a very difficult and expensefull task, which cannot easily be managed by any company. Obviously the high costs of development and production are increasing the final price. In the race for the uninformed customers many producers are using lenses with a 3,5 up to 5 times magnification, but a low light-transmitting for long distances. It should be noticed that also two identical devices with completely similar tubes, the device with a stronger magnification will produce a lower-quality image than a device with a lower magnification. The range in the near surrounding area (residual light area) is shorter than by using a device with a lower magnification – but with a higher light-transmitting. This fact is especially relevant for night-riflescopes. In some cases the producing companies are using a mirror-object-lens, which is reducing the dimensions of a night vision device but has significant disadvantages – the disguising (coverage) is not ensured, due to the fact that the mirror-object-lens is mirror based and also the light-transmitting is much lower under comparable conditions. The construction of the ocular has no impact on the range of the night vision device, but is very significant for the observation properties. For instance, a simplification of the construction of the ocular leads inevitable to a shape-distortion of the observed object and a low resolution on the edges of the image. The oculars of some manufacturers are able to produce only a part of the whole field of view, although the tube is a major and a most valuable component of a night-vision device. It is very significant for night riflescopes, that the ocular construction has an eye distance which is not less than 40mm, to prevent injuries in the eye region from the recoil force of the weapon. The ideal eye-ocular distance of a night riflescopes should not be less than 40 – 45 mm. It is also by no means irrelevant that an eye-ocular distance of 40 – 45mm provides a much better quality of photography and video recording. Most night vision devices have highly developed glass optics. The exceptions are inexpensive Gen. I night vision devices with plastic optics and also some civilian types of devices from leading manufacturers. Obviously the quality of devices with plastic optics is much lower than the quality of devices with solid glass optics. Some civilian night vision devices posses a built-in IR-illuminator, which provides the opportunity to illuminate the observed object, if there is not sufficient ambient light (residual light) to perform an observation in a passive state (without IR-illuminator). IR-illuminators are produced as laser, LED (Light Emitting Diode) and special incandescent lamps. It is important to note that laser illuminators may cause eye damages and the sales are regulated in some countries by the law. LED IR-illuminators are harmless for the eye. If the night vision device does not have a built-in IR-illuminator, it is possible to use an autonomous IR-illuminator. The most producers do not point out that the performance figures they supply are only the input power. The input power of a device is not equal to its output power. Thus, a IR-illuminator with 75mW output power radiates physically 70% more IR-light than a IR-illuminator with 75mW input power. This fact is a key factor for using a night vision device (image intensifier) in active state (with IR-illuminator). In some night vision devices a 900nm IR-light wave range illuminators are used. Their radiated light is not visible for the human eye and for the eyes of the most wildlife species. Such devices are used by military- or police operations, to preserve the coverage. A night vision device is more attractive for the customer, the smaller, lighter and the longer range it has. However, are these demands partly contradictory. A longer range, for instance, can only be achieved by using a device with a larger lens (diameter). The choice is finally left to the customer. Particularly worth mentioning is the construction of the night riflescope. The construction has to be shock resistant at 500G, thereby the reticle should be fixed, should not shift from its initial position and has to be remaining visible under all possible circumstances. A whole series of civilian devices for hunting, which recently were placed on the market do not meet the requirements of shock resistance by using heavy calibers like .338 Lapua Magnum, .50, .416Rigby. The construction of mentioned devices often does not provide the opportunity for mounting on various types of hunting rifles. Also a miserable constructed correction-mechanism or an incorrect mounting often causes a shift of the point of impact. So there are countless characteristics and special features in the construction and application of night riflescopes, thus it seems to be impossible to briefly introduce all of them in this short description. We highly recommend you not hesitate to contact us if you have some additional questions regarding this subject. We are pleased to give you further assistance. The user of night vision should take into account, that the observation range and the detection of the observed object is depending on the ambient light (residual light), the density of the atmosphere and on the contrast of the observed object and its background. At elevated ambient light (residual light) in a moonlit night or by using additional light sources, the observation- and detection range increases if the background of the observed object is bright – i.e. sand, snow etc. According to that: at low ambient light (residual light), higher density of the atmosphere and a dark background (loam, logs etc.) – the observation- and detection range decreases significantly. Before the purchase it should be clarified, regarding values mentioned above, which generation of the devices for which nature of task should be used. With sophisticated technologies the fields of application increases, but also the purchase costs grows accordingly. If there are no certain performance and/or image requirements for night observations, so take only the appearance and the price into account. For demanding observation tasks and professional operations, especially for Gen. I devices – please choose a device with a high light-transmission lens, whereby the relative aperture should not be higher than F1,5. We advise you to favor a night vision device of a well-known producer with large experience in manufacturing and selling. Also please prove whether the producer is able to guarantee a proper service during and after the guarantee-time. For professional and performance-oriented operations, only a few tube producers (we introduced above) are worth to be mentioned (Gen. II+, ECHO, SuperGen®, Gen. III, XD-4™ and XR5™). If you are interested, we are pleasant to describe it further and deeper. Exercise your right of return, if the purchased device does not meet the supplied performance data. Please also compare in practice whether the supplied performance data does fit the facts. Such product information is often supplied with excessive performance data and regularly varies according to the measuring method which is used by the manufacturer. Attention: please do not purchase devices without or with incomplete performance data, without tube data sheet (passport) and also without parameter specifications. Check the device before purchasing it, whether it is functionally correct. We hope that we could support you by choosing a right night vision device, with this brief and simple description. After you made a correct choice and have purchased the best suitable device for your tasks, you will discover with fascination the possibilities of this modern technique is able to offer. If you have any further questions please contact Alpha Photonics. We give you a detailed and fair advice.